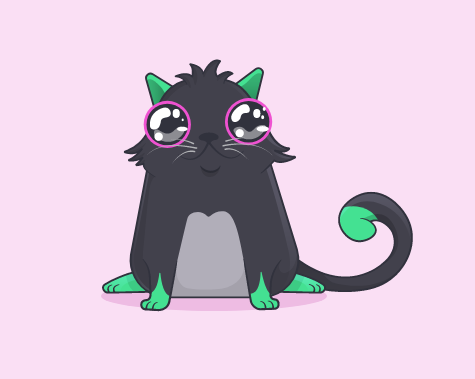 CryptoKitties has officially launched the much awaited ‘Family Jewels’ feature in the popular CryptoKitties game that took the Ethereum world by storm late last year, even causing the entire Ethereum network to clog up. This introduction comes amidst a slowdown in the game, as fewer players remain after the initial hysteria. Prices for CryptoKitties, that have sold in excess of $100,000, slowed down for several months after the initial launch month. The launch of this new feature and a release in China during the Lunar New Year is expected to make the game more popular. Diamond – the cat that shows the first ever mutation/basic trait. Only one diamond mewtation jewel per cattribute exists. It is the rarest of the Mewtation Jewels. Gilded – the first 10 cats that show the mutation/basic trait. Amethyst – the first 100 cats that show the mutation/basic trait. Lapis – the first 500 cats that show the mutation/basic trait. This is the most common of the Mewtation Jewels in the game. The above refers to the first cat that showed the tongue mutation, which was cat 3020. 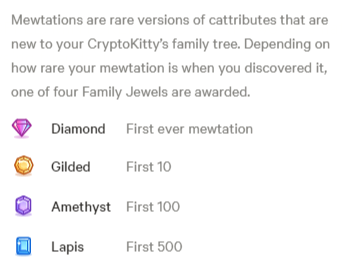 The Mewtation Jewels are going to be the rarest of the Family Jewels in the CryptoKitties game. For example, if you just consider the Diamond Jewels, there will only be as many of these as the total number of cattributes. 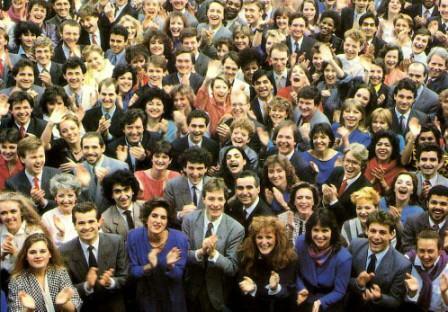 Once all the cattributes have been found, the number of Diamond Jewels will forever remain fixed. In terms of inflation characteristics, each time a new cattribute is discovered, there will be an inflation in the number of cats showing these Mewtation Jewels. 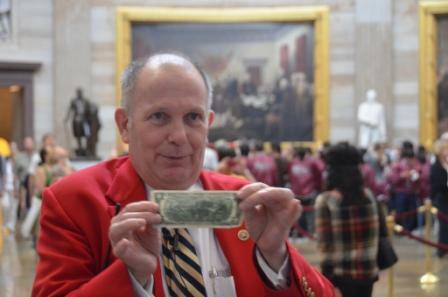 However, the terminal inflation rate is 0, i.e. once all the cattributes have been discovered, and 500 cats have been bred with all possible mutations, no more cats with Mutation Jewels will ever be created. We haven’t reached that point of course, but we are expected to reach that point around the end of 2018 when all the Gen-0 cats would have been created. 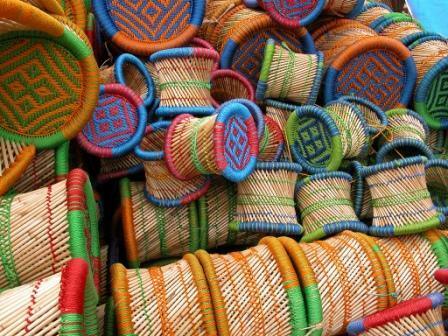 This inflation characteristic is different for Mewtation Jewels than Cattribute Jewels, which we next discuss. The Cattribute Jewels are derived from the original Mewtation Jewels as a heritage. What this means is that all the descendants of a cat with the Mewtation Jewel will have the same level of Family Jewels, assuming the cattribute is carried over to the descendants. What the above means is that this cat is a descendant from a Gold Mewtation saycheese and a descendant from a Amethyst Mewtation googly. When this cat breeds, if the resulting offspring has the saycheese cattribute, it too will have the Gold Cattribute Jewel. The same with other cattributes. The inflation characteristics of Cattribute Jewels is such that the number of cats with these jewels will continue to rise without an upper bound, even after all the cattributes have been discovered and no more Gen-0 cats are being produced. This is because two cats with a Cattribute Jewel can continue to breed and produce an offspring with that cattribute, which would carry the family’s jewel. The cats with a Mewtation Jewel will become rarer over time as a percentage of total cats in the game. This adds to some other rare features in the game, like Gen-0 cats, Founder (Jaguar) Cats, and Exclusive Cats. Therefore, it is expected that over time, the relative value of Mewtation Jewel cats will increase, especially the ones with the Diamond Mewtation Jewel. Cattribute Jewels are more common, but it is expected that cats with them will be more valuable than cats without them. Also, since the number of combinations of Cattribute Jewels is very large, breeders have a new target for their breeding in addition to hunting for fancy cats. For example, a cat with 8 Diamond Cattribute Jewels will be quite hard to breed and quite rare in the game. An important aspect of the launch of Family Jewels is that compared to before, higher-gen cats will also be valuable. In the past, a lower-gen cat would completely dwarf a higher-gen cat with similar cattributes. Now, the older-gen cats can still breed and try to collect more Family Jewels in their offspring, thus keeping the game more interesting for the older-gen cat holders. The breeding prices would also start to reflect these new Family Jewels. Cats with higher number and ‘quality’ of jewels will breed at a higher price, because if their offspring has the same cattributes, it becomes valuable too. Of course, this all depends on how much the players value Family Jewels compared to other features like Fancy Cats for example. In any case, Family Jewels represents a step up in the CryptoKitties game, giving the players and breeders something more to play. Axiom Zen, the creator of CryptoKitties, is well aware that it cannot rest on its laurels of being the first popular cryptocollectible and game on the Ethereum blockchain. Several competitors with more elaborate games from Etherbots to Aethia, are on its heels.